Cooke G, Mullally S, Correia N, O’Mara S, Gibney J. Background: Thyroid hormones are important for the adult brain, particularly regions of the hippocampus including the dentate gyrus, CA1 and CA3 regions. The hippocampus is a thyroid hormone receptor-rich region of the brain involved in learning and memory; consequently, alterations in thyroid hormone levels have been reported to impair hippocampal-associated learning and memory, synaptic plasticity, and neurogenesis. While these effects have been shown primarily in developing rats, and also in adult rats, little is known about effects in adult humans. There is currently no data regarding structural changes in the hippocampus as a result of adult-onset hypothyroidism. We aimed to determine whether hippocampal volumes are reduced in patients with untreated adult-onset hypothyroidism compared to age-matched healthy controls. Methods: High-resolution MPRAGE (magnetization-prepared rapid acquisition with gradient echo) scans were performed on 11 untreated hypothyroid adults and 9 age-matched control subjects. 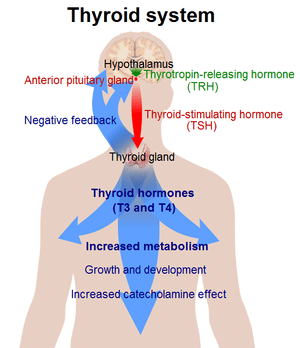 Hypothyroidism was diagnosed based on increased levels of thyroid-stimulating hormone (TSH) and reduced levels of free thyroxine (FT4). Results: Volumetric analysis of the right and left hippocampal regions, using functional magnetic resonance imaging of the brain (FMRIB) integrated registration and segmentation tool (FIRST), demonstrated significant volume reduction in the right hippocampus in the hypothyroid patients relative to the control group. Conclusions: These findings provide preliminary evidence that hypothyroidism results in structural deficits in the adult human brain. Decreases in volume in the right hippocampus were evident in patients with adult-onset overt hypothyroidism, supporting some of the findings in animal models.